The other day one of my Instagram friends posted a story about trying a matcha-to-go packet and being generally underwhelmed. 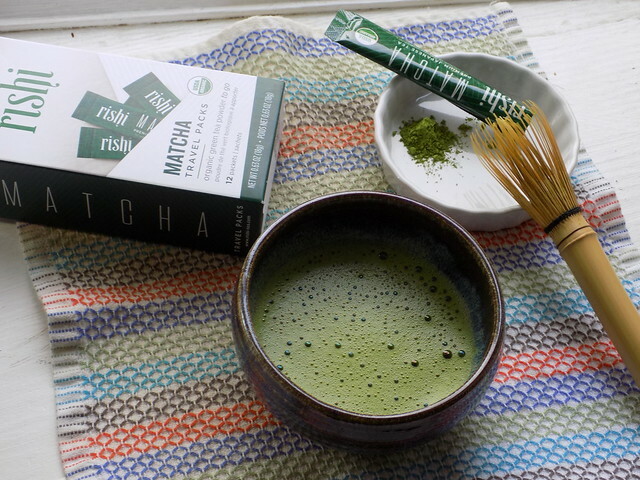 Well, that got me thinking about the things I like or don’t like in a matcha, given that I typically spend too much and drink it traditionally (or else make a latte). I’m not really a matcha-to-go person. But then I noticed that my grocery store had boxes of Rishi Tea’s matcha travel packs and thought I’d give them a try. Now, fair warning, these are not cheap. They’re actually about the same price as the regular Teahouse Matcha that Rishi also sells at the grocery store, which is also not listed as ceremonial grade. On their website, Rishi also sells sencha travel packs, which have powdered sencha tea for mixing into a water bottle, for a lower price. But either way, the Matcha Travel Packs are listed for $19 for a box of 12 packets, or about $1.05/g or $1.60 per serving. The packets are 1.5 g each, which I think might be a bit more than I usually use to make a standard bowl of matcha. That said, my grocery store loves to list things below MSRP, so I got the box for $18, or about $1/g and $1.50 per serving. For comparison, my current favorite ceremonial-grade matcha from Matchaeologist is Meiko and is sold at $14 for 20g, or about $0.70/g and just over $1 for a 1.5-g serving. So you’re paying for convenience, but probably not quality. Anyway, the official instructions for this powder say to mix one 1.5-g packet into a 16-oz. bottle of water, which already didn’t fill me with hope that this would be a quality, tasty matcha. I mean, if the flavor is going to come through when mixed in roughly five or six times more water than I would normally use, what is going to be there when tasted at a more concentrated level? But I pressed on. My first test was to try brewing it traditionally. I mean, it’s matcha, right? It should be able to be judged like any matcha I drink. So I sifted a packet into my matcha bowl. I will say, the powder was a pleasingly bright color and fine consistency. I poured in 2 oz. of hot water and whisked it up. I got a respectable amount of froth with minimal elbow grease, and then sat to enjoy it. It had a pleasant vegetal aroma while whisking. The taste is certainly not subtle, but I got notes of green leafy vegetables, umami, a smooth mouthfeel, and a balanced amount of bitterness. The reason I’m pretty sure it’s a larger amount of matcha than I typically use is because I felt a serious buzz, too. But all in all, not an unenjoyable experience. Which, y’know, for $1/g, I would certainly hope would be true. Next, I tried it in a matcha latte. I tried in both my cold almond milk, pre-workout, protein, sweetened matcha latte and in a standard, unsweetened hot matcha latte with cow’s milk. In both formats, I really appreciated how much the flavor of the matcha came through. 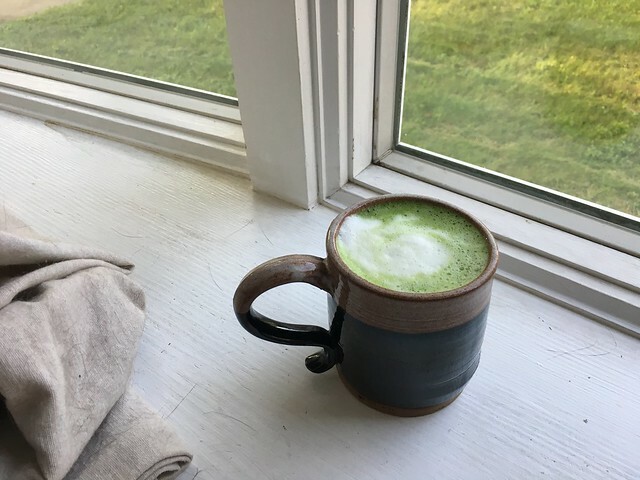 Especially in the almond milk latte, I need to add maple syrup to sweeten it up (because I use unsweetened almond milk) and I found that the Rishi matcha came through more strongly than my standard latte matchas. And it blended easily without and special equipment. For the cold latte, I literally tossed everything into a jar and shook it together without pre-mixing at all. Finally, I wanted to try the matcha the way it was intended: added to a 16-oz. bottle of water and shaken together. I filled my favorite glass water bottle with water, sipped a little off the top to make room, and then added a packet of matcha. I capped it and shook. It immediately blended into a brilliant green liquid, somewhat reminiscent of kale juice. Tasting it, the matcha flavor was even more complex in this format. The extra dilution allowed some of the subtler flavors to come through, including a floral sweetness that I found quite pleasant. It was refreshing and energizing without being overly bitter and without any grittiness, even down to the last swallow. Some of the powder would settle as the bottle sat, but a quick shake or swirl got everything suspended again and I never felt like I had a mouthful of powder or sludge. So, I would say that, all in all, I was pleasantly surprised by this matcha. I really wasn’t expecting much from a matcha that I poured out of a packet, but I have to say, this is a decent little matcha. It’s probably not the best price you could hope for, but I’m impressed with Rishi’s balance of quality and accessibility. They tend to sell their teas in local stores, so it’s not necessary to order online. And the convenience of a packet should appeal to some. I probably won’t buy this again too often, but I will definitely use what I have for travel. NB: I purchased this product with my own money and was not given any incentive to review it. All opinions are my own.